I seem to have this habit of completely embarrassing myself for the sake of education and entertainment. I’m not going to lie- I hate my feet. My mom has the most beautiful feet. She has never had dry, cracked heels or feet that look ashy in sandals 10 minutes after putting on foot cream. My dad on the other hand has pretty rough feet so thanks genetics! It started when I got to college. So much walking around campus in flip-flops and birkenstocks made my feet really flatten and become rougher. I got pedicures often but it seemed a few days later my heels would be dry. Not horrible, just certainly not anything anyone would admire. This has continued the past decade and being a makeup artist and doing various retail jobs throughout the years and now as a trainer for a major skincare brand I live on my feet. I no longer have arches so heels have become impossible to wear. I live in my Paul Green boots (seriously, almost every day for the last 2.5 years). Listen, these things work but you have to use them EVERY DAY. I don’t have time for that!! My stepmom was excited about this thing called Baby Foot and said “I HAVE YOU SEND YOU SOME!”. I was intrigued but at the same time very skeptical. I received my packages of Baby Foot about a week and a half ago. The results are ASTONISHING. Don’t scroll down if you’re easily grossed out. I took pics of the application but somehow lost them. It’s a pre-filled boot placed on your feet, best with socks over it. I wore them for an hour. Try not to walk in them, you will probably slip and fall. after 5 minutes of gently pulling. No pain. If it doesn’t come off easily, just wait. It will shed naturally. The thin skin is the hardest to remove. The tops of my feet weren’t ready when this pic was taken. 3 days later… Tops of feet are peeling still. I used multiple scrubs like Kate Somerville ExfoliKate Body & Caudalie Crushed Cabernet Scrub. Neither worked 100% yet. YES! BABY FEET ARE ALMOST HERE! Hello feet of my dreams !! Moving to LA was the best thing I’ve ever done in my life. I get asked a lot by my Midwest friends, “What is the best thing about living in LA?” There’s no way to answer because the list would be 10 miles long. One overwhelming positive thing about living here is the abundance of healthy food and the overall celebration of healthy lifestyles. Coming from St. Louis & Chicago, where late night bars and 5AM pizza places were on every corner, Los Angeles is much more focused on a healthy active life for it’s residents. There’s free hiking all over the city, a groupon deal every day for new places to burn fat and an overwhelming growth of healthy “restaurants” such as Sunlife Organics, Beaming and The Harvest Bar to name a few. While these places are popular stops for smoothies and organic cold pressed juices, my favorite thing to order is the Acai Bowl. It’s probably the healthiest thing I’ve ever eaten and you can feel the energy your body produces as you digest it. The downside is that these cost anywhere from $10-$15 a piece. Fed up with my $80/mo acai addiction, I went to Whole Foods this week and bought the ingredients to start making them myself. Trust me you guys- this is the easiest, most delicious healthy treat you can imagine! The best part is all of these health restaurants post their menu online so all you need to do is duplicate the ingredients. Fresh Fruit: Bananas*, Strawberries, Blackberries whatever your favorites are. I don’t use all of these ingredients in one bowl, but this gives you plenty of options to keep it exciting. The only thing you need to buy fresh is whatever fruit you want to put on top, the rest stays good for a long time. Blend handful of frozen strawberries, handful frozen blueberries and half of a fresh banana (save the other half) with acai powder (1 TBSP), nut butter (1 TBSP) and 1/4C almond milk (or milk of choice). Sometimes I’ll throw 1/2 TBSP of chia seeds in the blender. (Because I HATE blenders, I actually use a bullet which works perfectly for 1-2 portions.) You want the mix to be consistent to sorbet so start with less vegan milk and add little bits more if you need to get to right consistency. Add blended fruit mix to bowl. Slice up fruit and arrange around the top. I love fresh strawberries and blueberries on top. 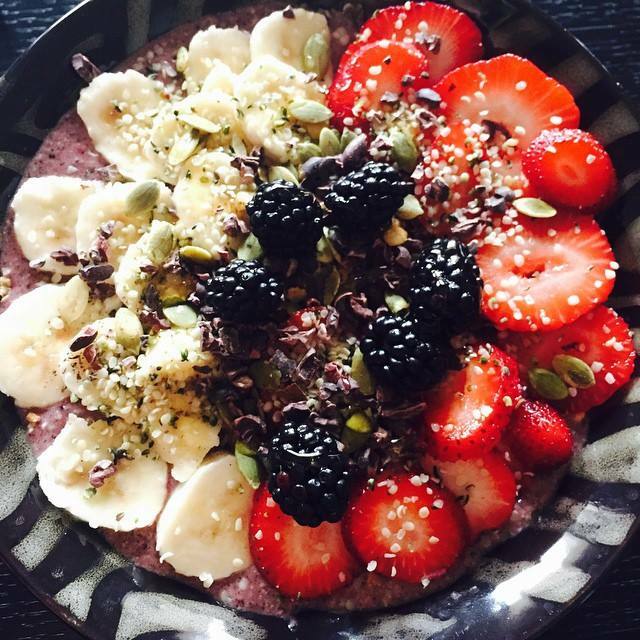 Top with 1/2 TBSP each of Hemp Seeds, Pumpkin Seeds, Cacao Nibs. Add granola if you’re extra hungry. Top with a swirl of Fresh honey (optional) and indulge! 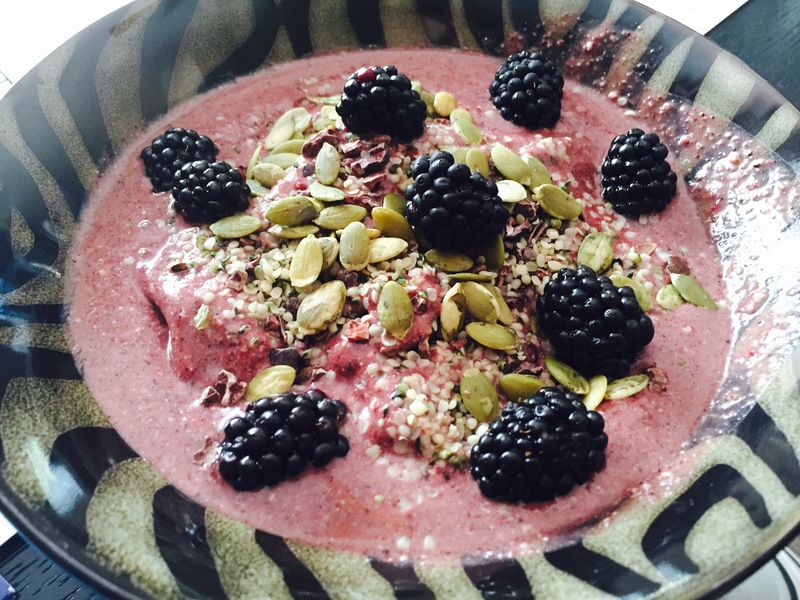 Base: frozen blueberries, banana, #acaipowder, almond milk. 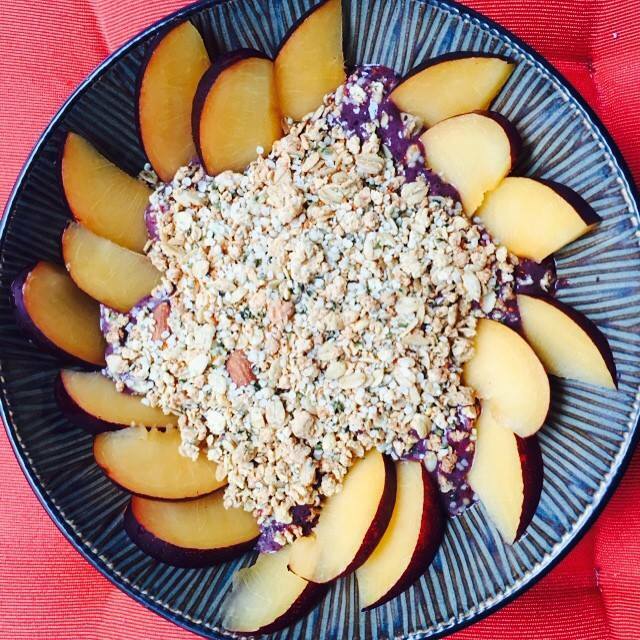 Top: #granola, #hemp, #plums, topped with #TAJIN. Are you REALLY getting sun protection? Summer is here! Well, “summer” is always here in Los Angeles, at least for a transplant like myself. The sun/weather is the best part of living in Southern California. It’s almost always a beautiful day outside, and there’s always a reason to be outside in it! Unfortunately 80% of the signs of aging (dull skin, uneven tone, wrinkles, etc…) are caused by free-radical damage. 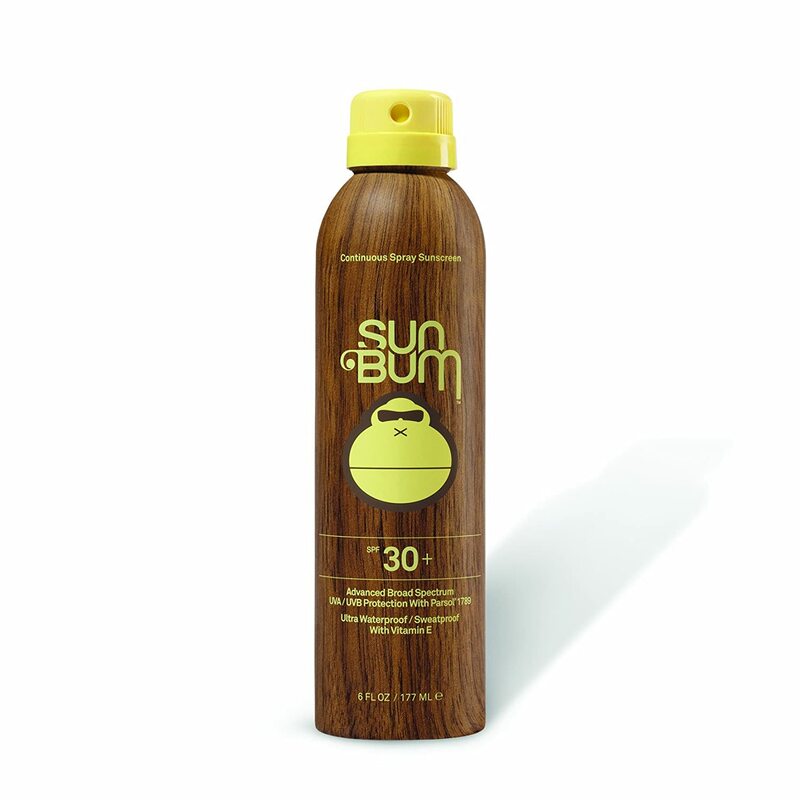 The sun is one of the biggest free-radicals you can expose yourself to and luckily for that we have sunscreen… or do we? Ask yourself- Where do you get your sunscreen protection from? No matter which answer you chose, you aren’t getting the protection you think you are. 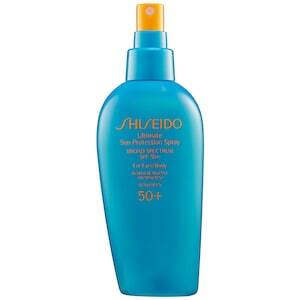 An SPF 50 lasts on average less than 2 HOURS. That is if you are applying the standard 1/4 teaspoon amount on your face. If you aren’t (don’t worry none of us are) cut that time down dramatically. Now imagine you’re using an SPF 15, 20, or 30, and less than 1/4 teaspoon. We are talking minutes of protection. Once it’s gone it’s gone and the sun is free to do whatever it likes while we remain with our pores clogged with white tinted goop. So what the hell are we supposed to do?! This post isn’t to make you feel bad or use scare tactics but rather an eye opener to stop the sunscreen myths. I always tell my clients, “When you’re on vacation at the beach do you just put sunscreen on in the hotel or do you take it with you to reapply?” Most always say they reapply. 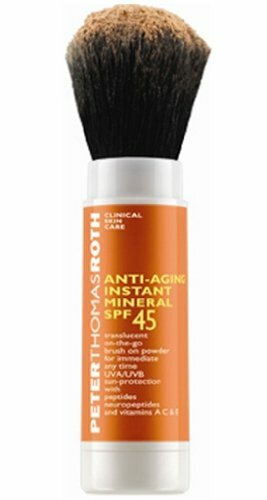 There isn’t a magical sunscreen that is for the face that doesn’t need to be reapplied. Sunscreen in your moisturizer/makeup/physically applied is great. For most people it will get you to work protected from the sun on your commute. What about us Californians who can’t avoid it? What about UVA/UVB light. Office light ages you just like the sun. How are we supposed to reapply sunscreen? Here are a few sunscreen saviors that I am totally obsessed with and so thankful for! 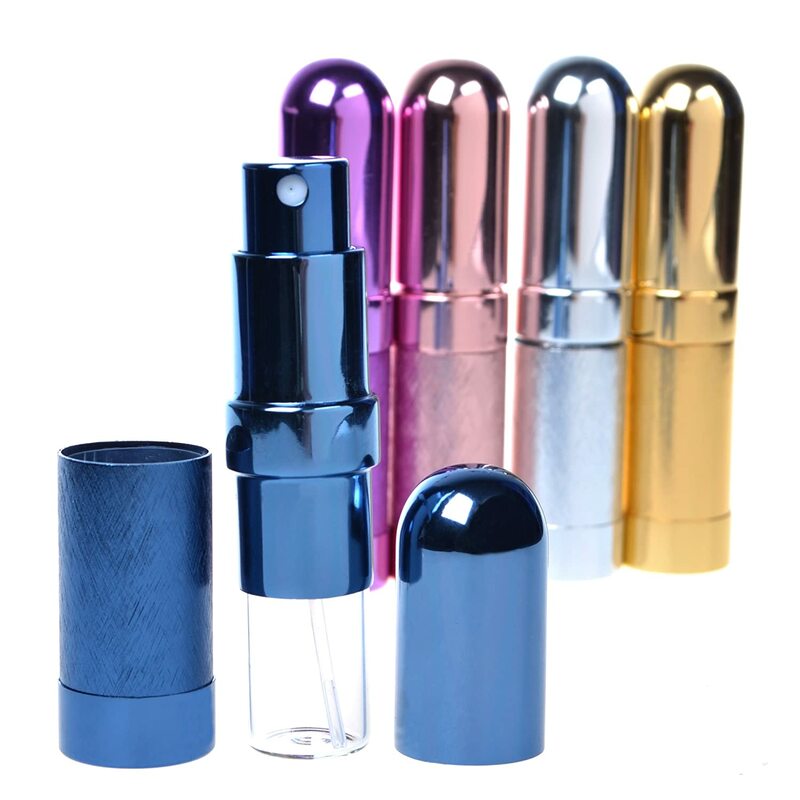 The first three I love because they are non-aerosol and you can pour the product into travel sized spray bottles and keep one in the glove box, and one in your handbag. The others are face and body. Either way, I hope you are a little more aware of how sunscreen works and how it needs to be reapplied. Now get out there and get your tan on! Going back to the makeup thing, it’s not like you will be reapplying your foundation every hour so here are some simple sunscreen powders to carry in your touch-up bag. These next two are aerosol and I like to use them mostly from the neck down although you can use on the face. Sometimes they make my eyes water. One of the biggest mistakes I see people make when I’m in stores is asking “what is the best _______?”. Regardless of what you’re looking for say foundation, toner, mascara, shampoo… there is no such thing as “the best”. With makeup, a multitude of questions arise when someone asks me what the best thing is. My brain goes into “guess-who mode” as I like to call it and as I ask clients questions such as “What kind of skin do you have? How much coverage do you like? Do you want to use fingers or a brush? 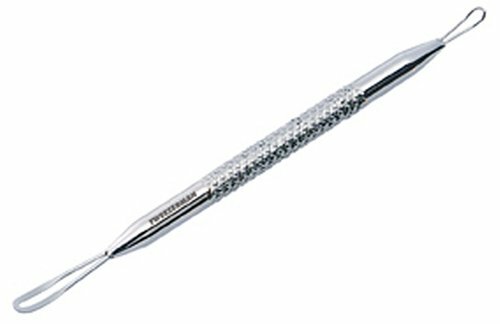 What kind of finish do you like?” my brain narrows down to the perfect product for them. This kind of thing can only happen when you have a brain saturated in every cosmetic brand and product the way that mine is. Skincare is a lot more simple and you can use a similar “Guess-Who” method when trying to pinpoint what the perfect product will be for you. The problem with just asking someone is that you never know their experience. A lot of times someone will recommend the brand they work for because it’s the only one they are trained in, other times you’ll go to a store where there are a lot of brands and find someone that will recommend the last product they were trained in because it’s too much to remember for them. The point of this blog entry is to teach you to narrow down what it is you’re looking for so that you can be your own stylist, then of course read reviews or ask for help deciding between a few products. Eye Cream is a product that people constantly buy different ones of each time because it didn’t do what they wanted. If you can learn to identify what it is you want, you can quit wasting so much money and be happy with your purchase. Ah, Puffiness. Those awesome little camelsack’s under our eyes. The good thing about puffiness is that it’s the easiest to fix, not to mention the cheapest! Puffiness is just fluid that accumulates under our eyes and can go away without the use of a magic wand. 5. Anything Cold or Cooling! This is an old’y but a good’y. Packed with caffeine and a nice velvety texture. 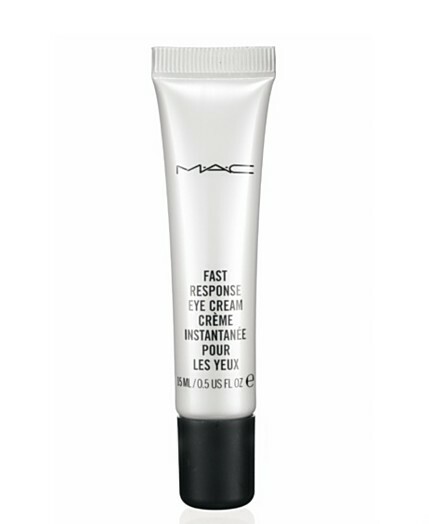 MAC Fast Response Eye Cream is the perfect kit essential for a quick “cup of coffee for the eyes” although it lacks in the hydration and anti-aging department. An affordable option for an eye cream when puffiness is ruining your morning. Claris uses wild rose to visibly depuff after just a few minutes. 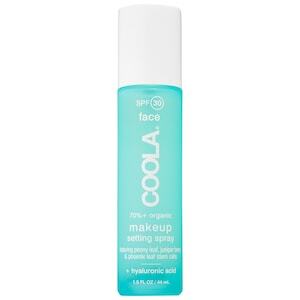 Provides a nice cooling effect and makeup base. Nice essential to use as needed but would recommend another eye cream with it that will provide more hydration and anti-aging. This natural yet supercharged formula is one of the fastest de-puffers I’ve ever used on clients. 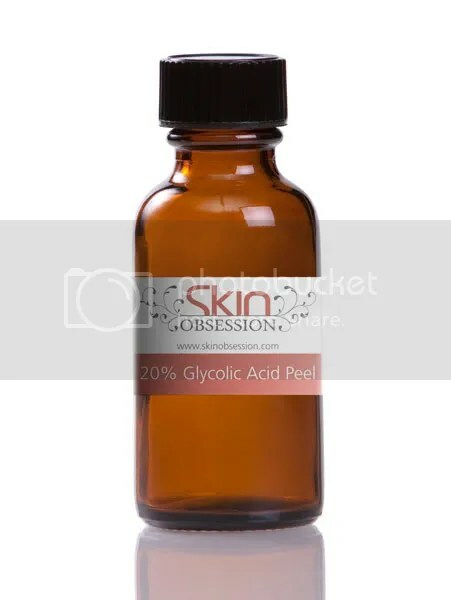 It’s a quintessential part of my kit for red carpet makeup and can be used day & night alone or under another eye cream to not only send your bags on vacation, but eliminate deep wrinkles and dark circles as well with a blend of Vine Resveratrol, Peptides and Matrixyl. There are two types of dark circles- the blue/green discs you get under your eyes from lifestyle (lack of sleep, too much computer use, etc) or the hereditary dark circles (seen a lot in darker pigmented skin such as Indian and African American). If you have lifestyle dark circles there’s a ton of great eye creams for that. Anything that promotes blood stimulation will reduce the dark circles. The good news is that you can do some at-home remedies as well that don’t cost a thing! If you have hereditary dark circles you’ll spend thousands of dollars and never find an eye cream that works for you. You’ll need some special treatment such as eye creams that work against excess melanin. 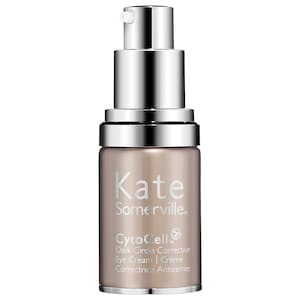 Kate Somerville has always been one of my favorite skincare brands. 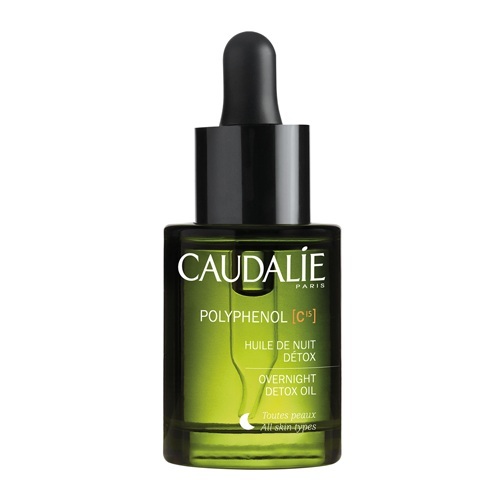 Packed with peptide P-199 this concentrated treatment helps with dark circles, fine lines, wrinkles and puffiness, achieving a younger, more radiant appearance result (Sephora.com). 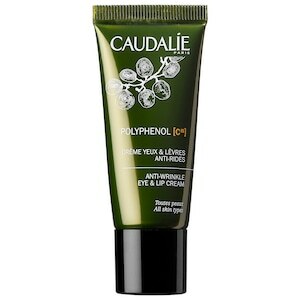 The Premier Cru eye cream from Caudalie is a great choice whether you are puffy, wrinkly or dark under the eye. This formula has different ingredients to target every sign but where it shines the most is in the brightening department. Not only does it fade lifestyle AND hereditary dark circles (using patented ingredient Viniferine clinically proven to be 62x more effective than vitamin c), it has a mineral pigment in it that gives you an instant brightening effect under the eyes. This is what I’ve been personally using and am completely obsessed with. Regardless of whether or not the price is justified, the instant and long term brightening benefits of the Creme de la Mer Eye Concentrate can’t be disputed. It’s been a long time favorite of mine for dark circles and fine lines and the applicator wand feels super luxury in the morning. Do you have wrinkles all the time around the eyes or just when you smile. People complain that they have lines when they smile… no kidding? Your skin has to go somewhere when your muscles move. Have you seen someone smile and their face doesn’t move at all? I saw a Bette Midler poster last year and she was smiling huge yet her eyes had no wrinkles around them at all and it was the scariest looking thing I’d seen in a while. I wish I had a picture of it. Hopefully it was just bad photoshop.. I digress. The point is- if you have wrinkles when you’re not smiling or expressing, an eye cream can fix that. If you want to be frozen, a temporary face tightening product or a needle filled with Botox can fix that. This is the most complicated category to shop for, because everything is literally anti-wrinkle. 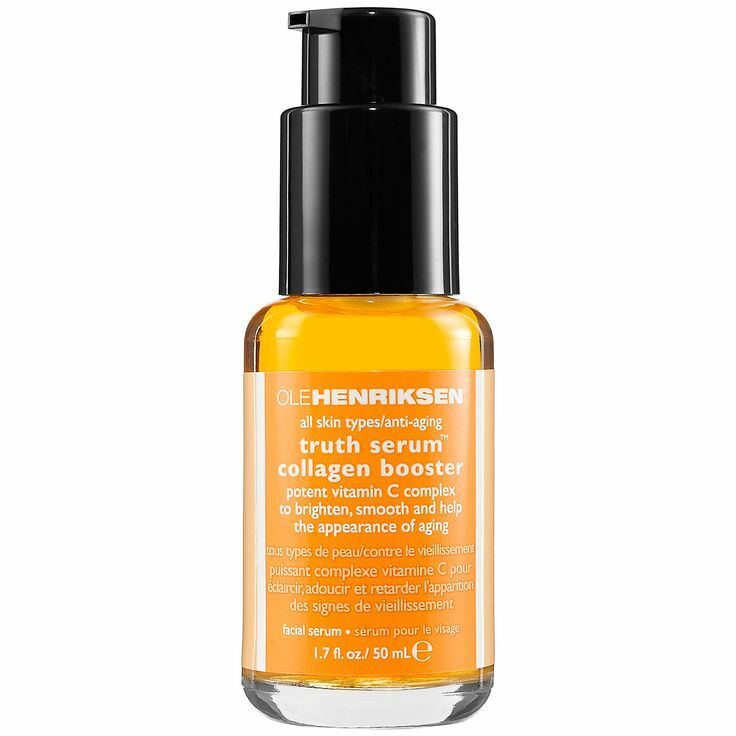 If there are anti-oxidants in the product it is anti-wrinkle. What I’m going to post are not “anti-aging” eye creams, but *corrective-aging* eye creams that actually do something to take away the lines. Sometimes it’s not just a certain ingredient but a blend of ingredients that make a product awesome. The C15 eye cream is a great choice not only because of it’s clean bill of health ingredient list, but the fact it is 15% Vitamin C Ester from non-gmo corn vs. citrus. This little cream quickly diminishes fine lines before they become deep wrinkles and according to my friend Dena, makes her boyfriend feel uncomfortable because he’s getting too pretty. 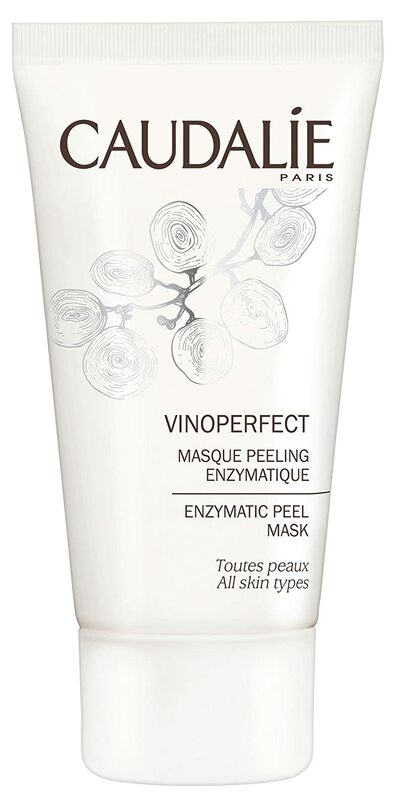 On top of the correction aspect, C15 has patented grape seed polyphenols, the strongest anti-oxidant in nature to keep 100% of wrinkles and signs of aging away. Remarkable at a remarkable price. My beloved steam-roller. Bio-performance eye cream is so good that it makes me wonder why some other brands even try. 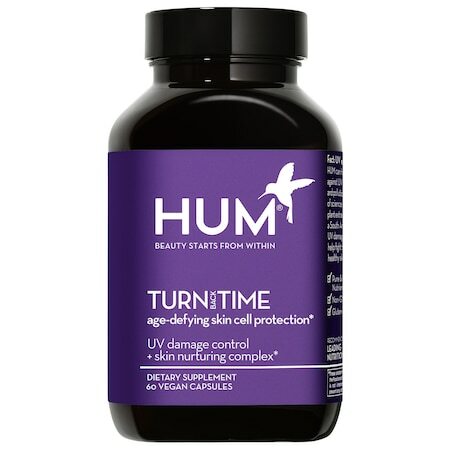 Nightly use of this cream eliminates years of aging with a blend of yeast, rosemary and Vitamin A. The instructions say this can be used daily and nightly, but because of the Vitamin A (retinoid) I’m going to recommend this one at night with a less intense eye cream during the day. The price point is shocking but when you want crows feet to go away quickly look no further than the Eye Contour Balm from Cle De Peau. The pure retinol exfoliates wrinkles away while a blend of anti-oxidants help keep them at bay. Brightening, Firming, Preventative. 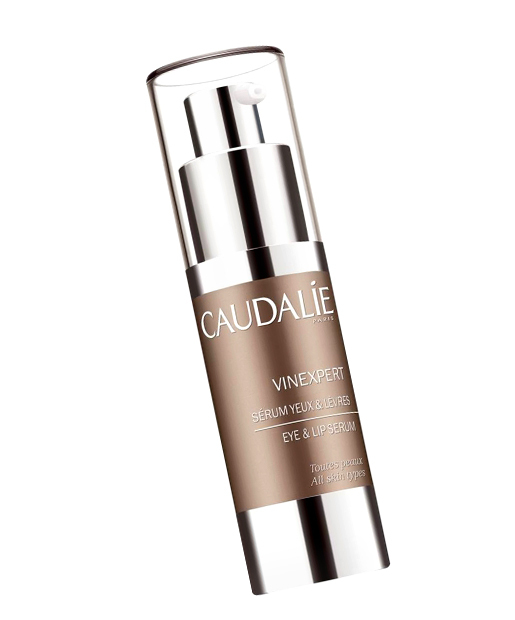 Unique blend of Viniferine, Vine Resveratrol and Grape seed polyphenols which dominate in the brightening, firming and prevention categories. Recyclable, eco-conscious packaging. 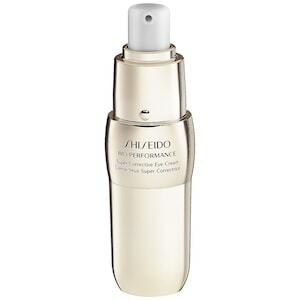 Uses Shiseido technology to identify problems and fix them. Sounds crazy but it works. This is one that is a word-of-mouth product that I have seen many clients buy continually because of how well it works. Use on eyes and lips. This eye cream is literally so good you can feel it working, watch it working and keep it in your purse to touch up over your makeup (there’s even a little mirror on it). One of my all-time favorites. Instant results + long term results = empty wallet. You feel really rich and classy putting this on (pinky in the air happens naturally during application), which might make the results seem better than they are but hey, I’m not complaining. This is the rare blend of absurdly overpriced product and beautiful, long lasting results. 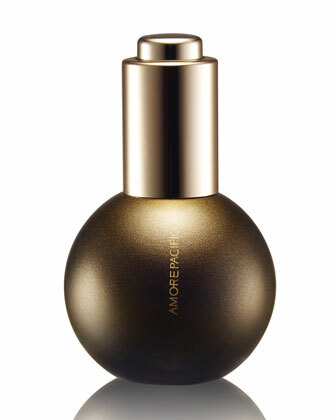 What are your favorite eye creams and what kind of results have you gotten with them? 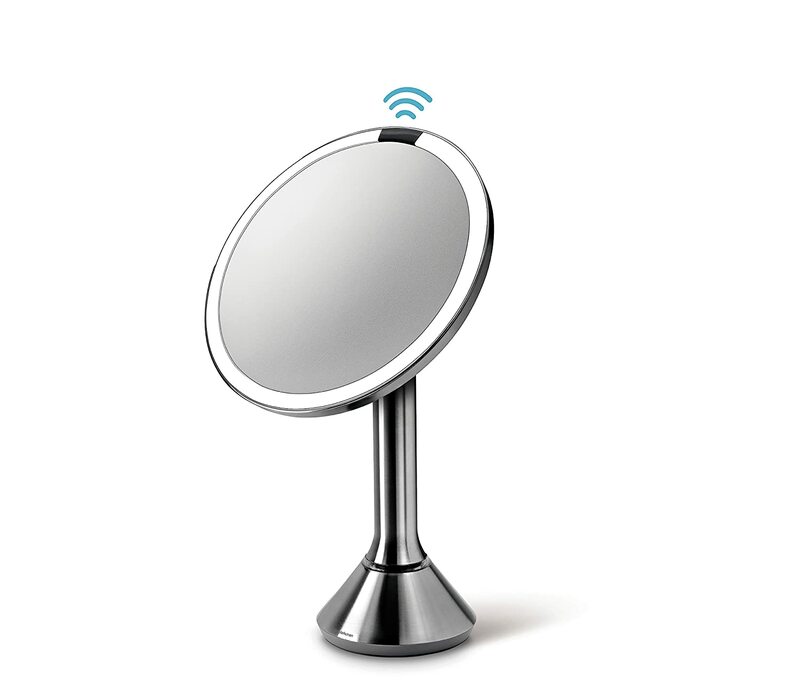 Simple Human Mirror Review – Never leaving the house again! Several months ago a friend and client Effie reached out to me to boast about this amazing new mirror she got from her hubby. She mentioned this simple human mirror and I made a mental note to check it out sometime. I didn’t realize just how awesome this mirror was. Now that I’m training in Sephora’s around the West Coast 5 days a week I stare in it almost daily. 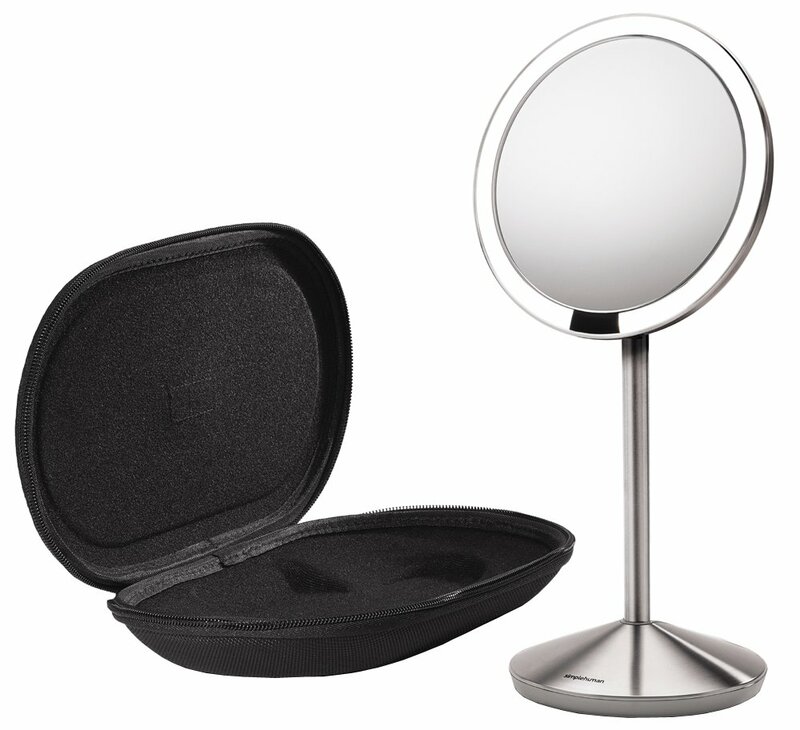 It has the most brilliant white light for makeup and turns on automatically when you lean in (charges with USB). The vast amount of things you can see in this thing is insane!! I meant to buy it during Sephora friends and family for 20% off but missed out. 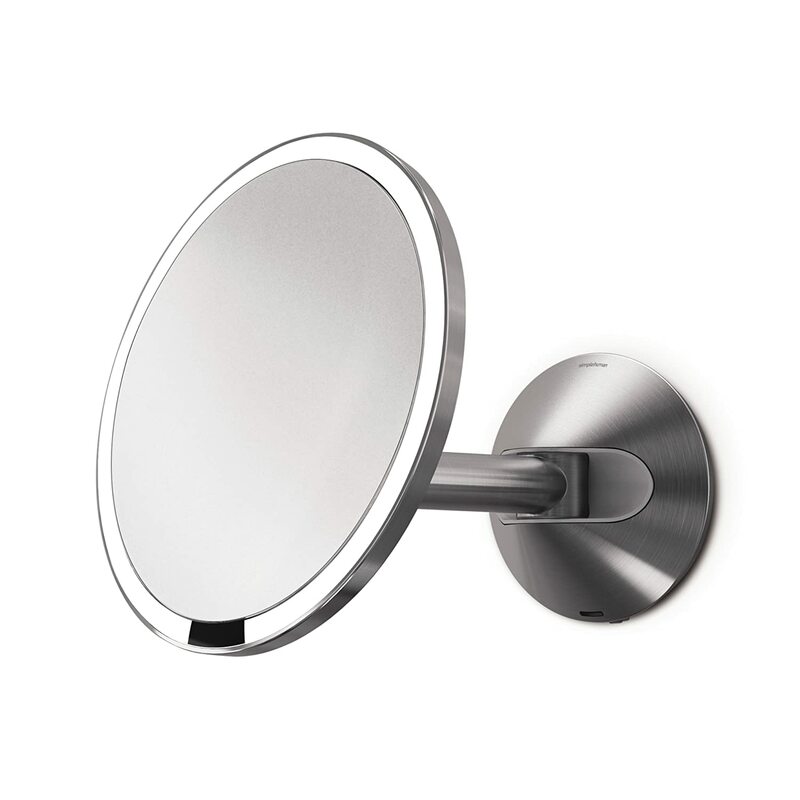 The Simple Human Mirror comes in 3 forms: The Small, The Large and the Wall Mounted. Click on any of the pics to view on amazon. I finally took the plunge and purchased one and have not regretted it whatsoever. I chose the small not just because of the savings but because with something so magnified you’re usually only focused on one part of your face at a time so the larger doesn’t make much difference. I spent 2 hours the other night with my extractor dipped in alcohol just getting everything out of my face.. it was gross and amazing at the same time. My friend Tim came over and spent 30 minutes plucking hairs he never knew he had. It’s wondrous. Best purchase of 2015 so far! Great way to spend those Holiday Amazon gift cards! Consumers are always waiting to jump on the bandwagon of social awareness regarding potentially dangerous ingredients. At this point in time “Parabens”, “GMO” and “Sulfates” are commonly known words that inflict instant fear. What is is all about? All these things are believed to harm reproductive health and lead to cancer . One thing I’ve been reading about lately is “Phenoxyethanol”. I had to share what I’ve learned because it’s literally in just about every single cosmetic and skincare product I own. I’ve read many lists online of “Ingredients to avoid” but this is rarely listed. There are many mixed reviews online, but coincidentally many of the positive reviews are coming from companies that use the product themselves and would lose profit if people boycotted the ingredient (such as Paula’s Choice and The Honest Company). Phenoxyethanol is an alternative to standard, potentially harmful formaldehyde-releasing preservatives. 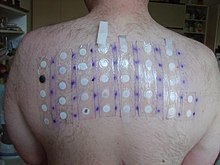 In 2005–06, methyldibromoglutaronitrile/ phenoxyethanol was the ninth-most-prevalent allergen in patch tests(5.8%). The Food and Drug Administration has warned that the chemical is toxic to infants via ingestion, and “can depress the central nervous system and may cause vomiting and diarrhea.” Combined with Chlorphenesin, these two chemicals can cause respiratory depression in infants. Since these chemicals are often present in cosmetics and lotions applied to the hands and are easily ingested, caution should be exercised. German research in 1999, concluded that it had neurotoxin potential, but in a concentration-dependent manner. 1. It has dangerous neurotoxin properties only in high concentrations. If your product contains Phenoxyethanol but it is one of the very last ingredients listed you’re probably fine, it’s in a very low concentration. 2. 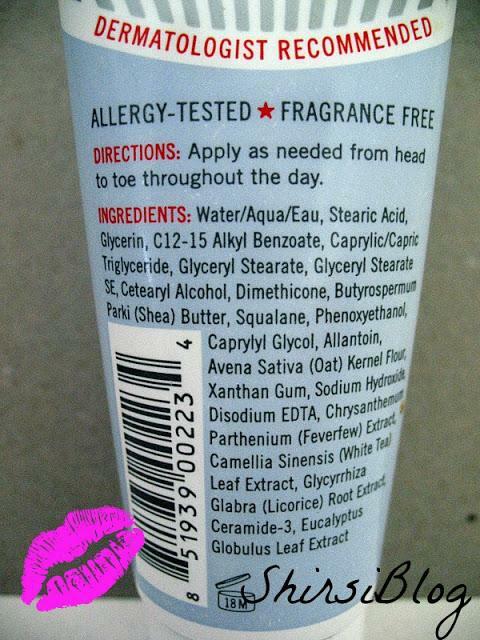 Something can be labeled hypoallergenic and all natural but still contain Phenoxyethanol. 3. It’s equally as dangerous as parabens (which are not all that dangerous to be quite honest). Seeing a product boast about being “paraben-free” while containing Phenoxyethanol is a total oxymoron. 4. Many companies are looking to find an alternative ingredient that can also kill bacteria and mold. 5. It’s bad enough to be banned from European ECOCERT companies. 6. You’re not going to die if you use it, but try to avoid it if you can and especially if it’s high on the ingredient list. Read your product labels like you do for food. Also, don’t be a jerk and warn about dangers of ingredients while eating Kraft food and drinking Diet Coke. Cancer is so prevalent now because of our lifestyles and what we are ingesting. It’s nearly impossible to be completely green but try to stay informed and make the best decisions you can. When I started carrying my brushes to sites I realized quickly that they would need some sort of identifying mark. As a MAC artist I chose nail lacquer in a sparkly silver color that was unique to me. I carefully dotted the bottoms of all my brushes so that they could be easily identified when working with a group of artists who were all using so many of the same brushes. It worked out just fine but I was pretty indifferent to it. Fast forward to the present where I work as a Tarte educator and artist and I have theses gorgeous bamboo handled brushes. I was inspired by all the beautiful patterns and decorative colors on the Tarte bags and products and I wanted to personalize my sets with something a bit more exciting. I found this fabulous Duck Tape brand tape from Target. I wrapped the handles of each of my sets differently to keep them cute, organized, and easily identifiable in events and trainings! I hope you like this trick. I included the amazon link so you can peek at the tape I used in the photo plus the other fun patterns polka dots, stripes, all different sizes even.